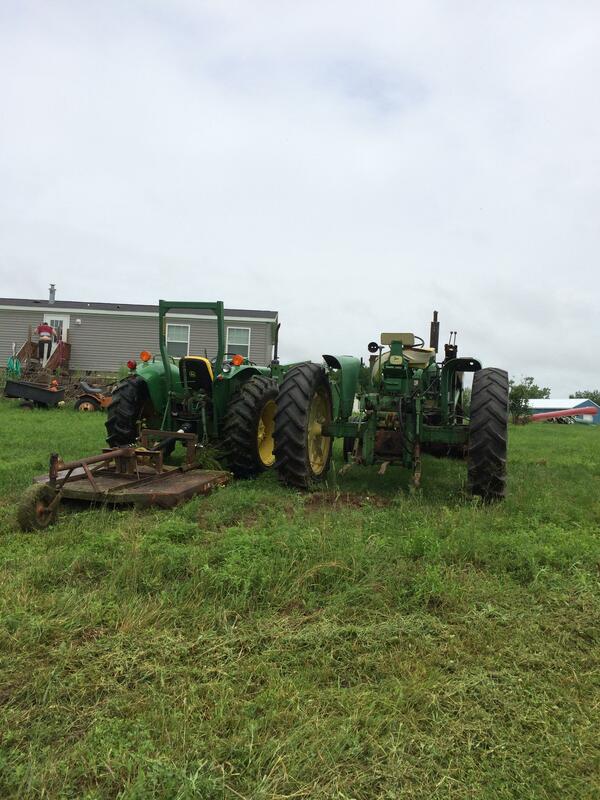 So we looked at a lot of tractors on craigslist and local dealerships. One dealer had 4 old J.D's I went there to look at specifically. They refused to show them to me. Not enough commission I recon. This was half the price of the new C.U.T we were looking at. It's a 1986 but was kept inside and treated with care. To compare this to the 2010. I couldn't mow flat and level with the hog up high, and on the hill the 2010 would nearly stall. This 1050 with only a 3 cylinder turbo charged Yanmar could mow with the hog down low, in the highest low range gear (4th) and UPHILL like it was just cruising down the road. The bucket is crazy easy to uninstall and reattach. All the lights work and the tin is very decent. Few dents in the hood, from logging I'm thinking. 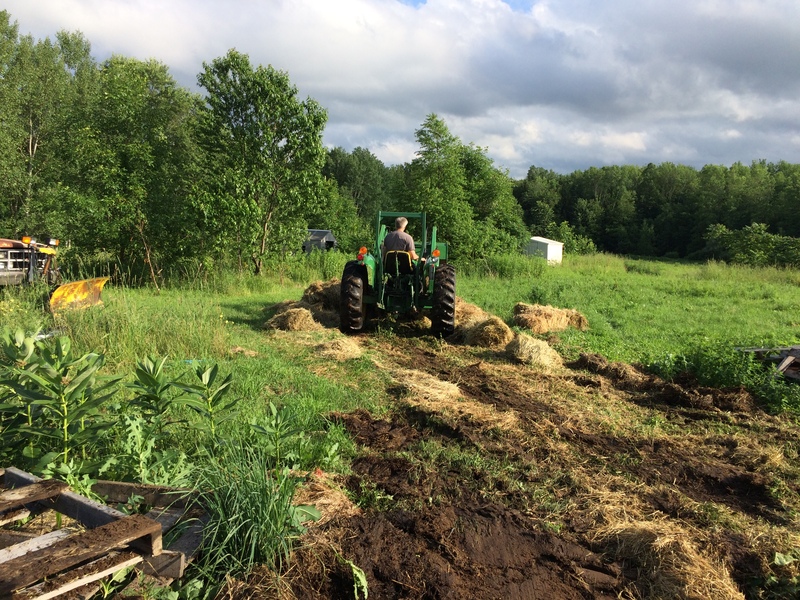 I back bladed all the old horse hay from the side of the barn to park it inside. I need to extend the wall and roof some more though. Gotta keep it out of the sun!!! That looks to be just about the handiest size a guy could find....not too big, certainly not too small! 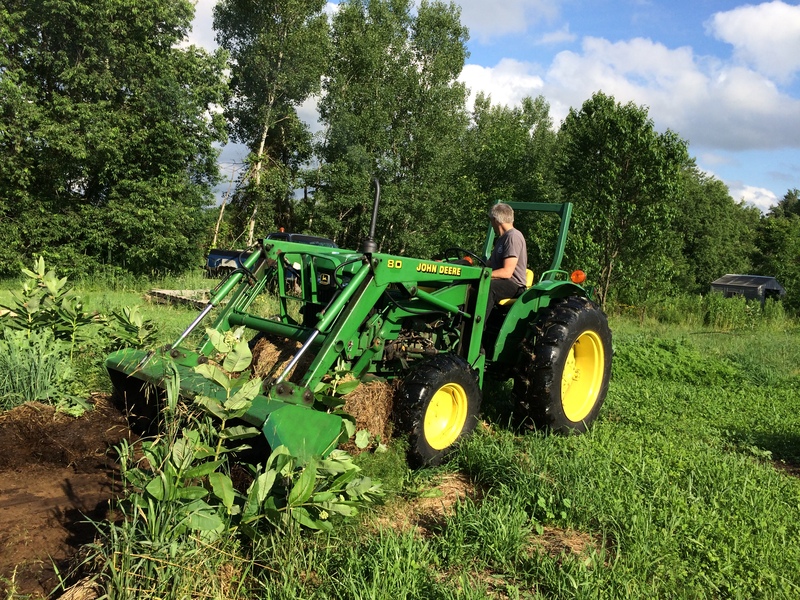 You'll love the Yanmar engine, we ran one in a smaller mid-size excavator for several years digging septic systems and footers. Runs great and lasts very long. A lot of power from that package. Yours with the 4WD will be great to have around your place!! Congrats! Thank you. It's 37 HP. The front seals are leaking a little. I think I'll gt all the seals and do both side at once. I have the books and it looks super easy to change them. 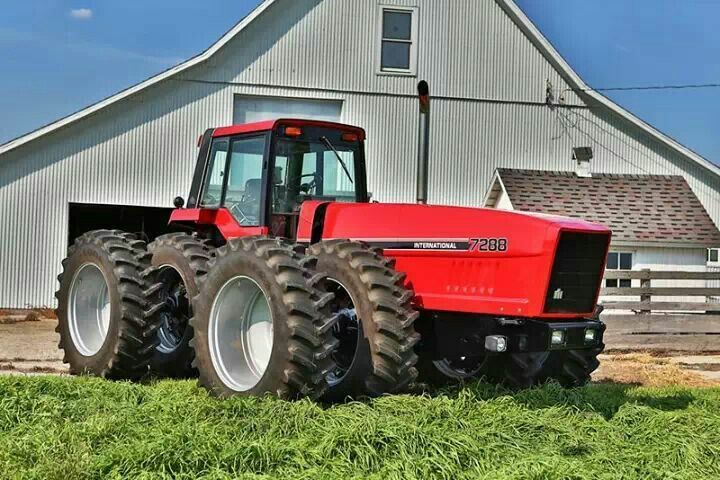 That is a terrific tractor. Glad you found it. It would be ideal at my place for a lot of things and would work great pulling my weed spraying tank around. You did well. That is a great looking machine. i had a 18'hp 3cyl diesel yanmar . i really miss that thing. it was a little workhorse. Wanna know something funny, or worrisome? The oil hasn't been changed since 2014, But it has had 31 hours put on it since that time.! The P.O. wrote the hours and date on the filter. It seems he took care to do the maintenance at the proper intervals even flushing and refilling the radiator. I bought 90 wt and oil and filter. Now if the rain stops I'll finish the oil change and top off the front axle. I'll get video of the removal of the f.e.l. you won't believe the simplicity!! If you didn't get a 'book' with it, I would encourage you to do so........they're THE most valuable accessory ON any machine. I did wolfy. Owners manual and shop manual for the tractor and the owners manual for the loader. I ran it for 4 consecutive hours brush cutting even trees under 2". Nothing even makes it grunt. I still wish the 2010 would run right and I'll still putter with it. At least to get it ready to sell But it feels good to know this will start and run every time. It's pretty quiet too. This is fourth gear at pto rpm. YM makes a good machine. pull two levers, lower the arms until the legs will clear the front axle, unhook the 4 lines. done!!!! opposite to attach. I had a leaking spindle seal. It's normal for this machine and needs to be replaced every 200 hours or so. The parts are cheap too. So I pulled the left side which was leaking the most as the right side recently had new hub bearings replaced with the seals. What I found was a few chunks of ball bearing retainer in the 90wt in the very bottom of the knuckle. I found the outside bearing was bad. So I took the whole hub apart and ordered the parts shipped next day. Ordered them 2:00pm Monday from California and they were on my porch 10am this Tuesday morning. I was able to put the whole thing back together in about an hour. Now I have to put it back on the tractor and pull the left for just the spindle seal. All new bearings and seals. total cost $381 to my door. I'm very pleased with the service from http://www.hoyetractor.com/ My John Deere dealership was no help. They didn't even think it came 4x4. From what I understand it's all Yanmar painted JD green. I am fortunate that the bearing didn't go bad and there was no internal damage from the few pieces of retainer. I'm so happy with this machine. so easy to work on and incredibly strong for the size. I found one that was very well taken care of and I'll continue that tradition!!! What, if I can ask, do these tractors run for a good used one? I can buy a new LS 27 hp with a loader, 3 cyl. diesel, for about $16,500. My concern is that I have never seen one in use around here. We have a new dealer who is a repair shop and sells the LS brand plus used tractors. I am concerned about resale on the LS. 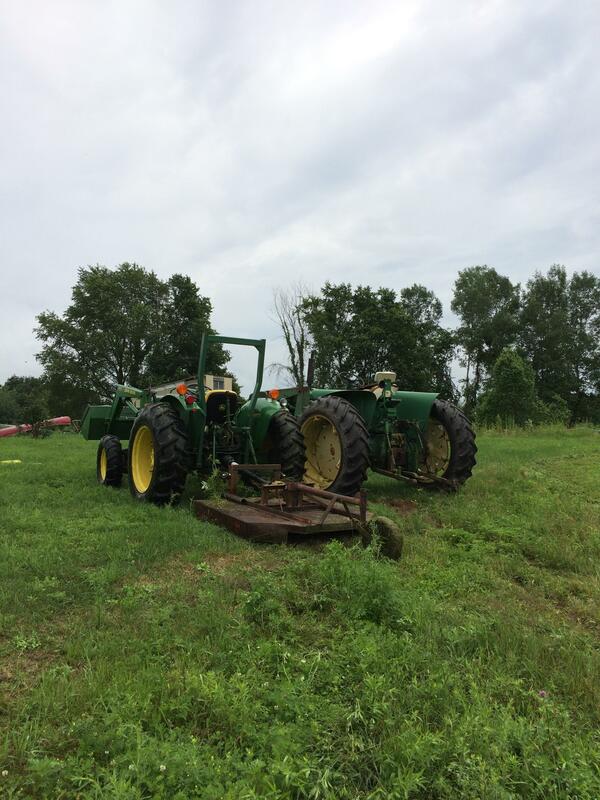 This is John Deere and Case country around here and if I get an Asian made tractor like John Deere makes it will run in the mid to high 20K range. I think the best bet would be to look them up on e-bay. this 1050 was going for 9,000 to 10,000 but beat up and rusted. I found this garage kept low hour one on craigslist and paid 11,000. You really need to look up parts too. If you can't find common things like starter, clutch, or axle seals don't buy it. 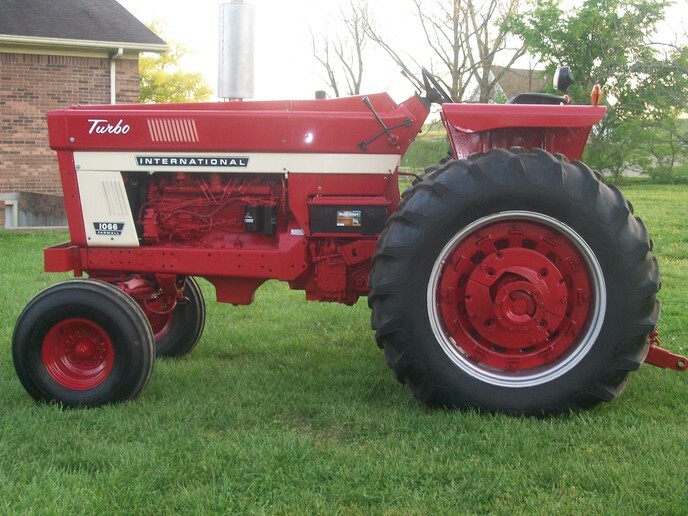 some older tractors are all standard sizes like for bearings and o rings. That doesn't mean pistons and rings are available. We had a dealer selling new TYM but it only lasted about a year and there are no parts to be found. I almost financed one, it seemed very well built and easy access to all the maintenance parts. I'm glad I didn't. Why resale value? I bought this 1050 to keep forever. Or the next 30 years I may have to live. LOL! This website will give you a lot of information. In the description there is a link to the manufacturers websites. I didn't find any info on the engine. Japan makes some real good stuff. China not so much. Thanks for that info. I have been on Tractor data a time of two. There are some parts places around here for old tractors but the John Deere stuff is pretty well limited to the tractors made here. I putted around on that LS and for what I do with a small tractor spraying weeds, plowing the driveway, and pulling a hay rake around it would do fine I think. Resale is important to me because I am 71 soon to be 72 and have enough health issues that it is reasonable to think I may not be here in five or six years. While I hope to last till 80 the facts don't look all that good for that happening. If it happens my wife will probably sell this place and move to town and I don't want to saddle her with a tractor that is going to be hard to sell. LS does not have a high resale - but they do make a decent machine, as do TYM & Mahindra. look at it this way -- they're a lot like cars: Hyundai has a higher resale point than Kia - but it costs a lot more new as well. Yanmar used to make JD's compact tractors -- even so, JD green paint has a higher resale even if the tractor is otherwise identical, because of the name plate. I have more than 1 tractor , cough(5)cough but my main user is a Yanmar YM336d of which I've bought 3 , sold 1 and 1 is a parts machine . While Yanmar made a lot of the JD compacts there is no JD version for this one but it's a well built machine . Since it wasn't green or orange it was able to be bought for little money 2400$ for the first one which is sold , 1200$ for the second that was in a fire but ran great and 2500$ for the third which was complete with a factory loader that had a self inflicted hole in the block . After looking at the Yanmar and seeing the JD variants , for resale I'd be looking at the Kubota/JD but if it was a one time purchase it would be Valtra/Zetor in the big tractor and Yanmar then Branson/Manhindra/Kioti then lots of reasearch on the others . Dancan, what area of the country are you where yanmar's are popular? 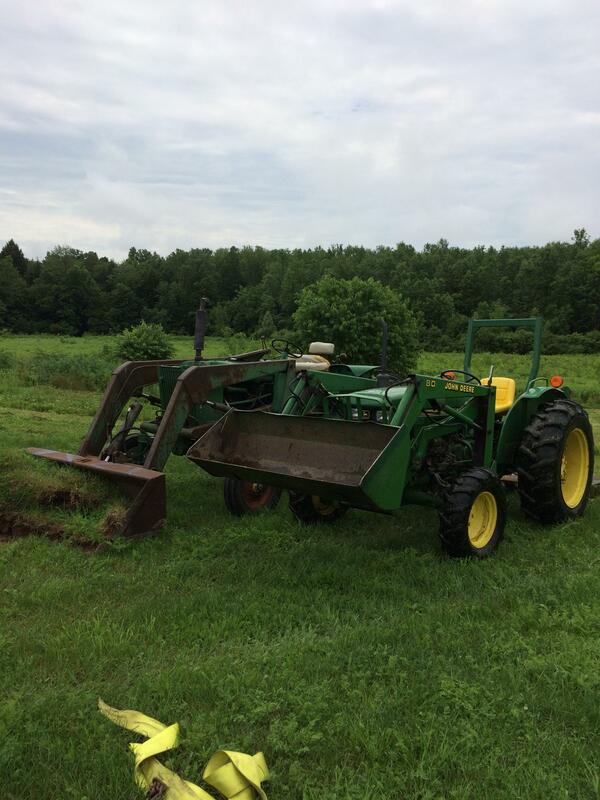 "While Yanmar made a lot of the JD compacts there is no JD version for this one but it's a well built machine ." That has to be somewhat true. My local JD dealer didn't think this 1050 was offered in 4X4 and couldn't look up any of the parts I needed. Meanwhile Hoye has it and the parts listed for it. I think there may have been different production being made at the same time at different facilities? I was introduced to Hoye tractor by a gentleman on yesterday's tractor whom stated my 1050 had the same front axle as the yanmar 336D. The parts schematic looks the same anyway. Can't say about the sizes and fitment. No matter how you look at it, it's a gamble on used equipment. Why are they selling? I was lucky enough that the gentleman was forced to liquidate and down size.(divorce,medical,...?) He was very reluctant to let it go and wouldn't stop talking about the tractor and how to check this and that and he stressed multiple times to watch the gear oil in the front axle. That is fixed now!!!! Wsdstan, Light work like that, can be done with just about anything. Get the cheapest you can in the best shape you can find. I planned to spend $20,000 on something very new, but this one turned up and I couldn't pass it up. I like Dancan's deal better though! I use a 1963 Oliver 550 gas to pull the weed sprayer around and it works extremely well. 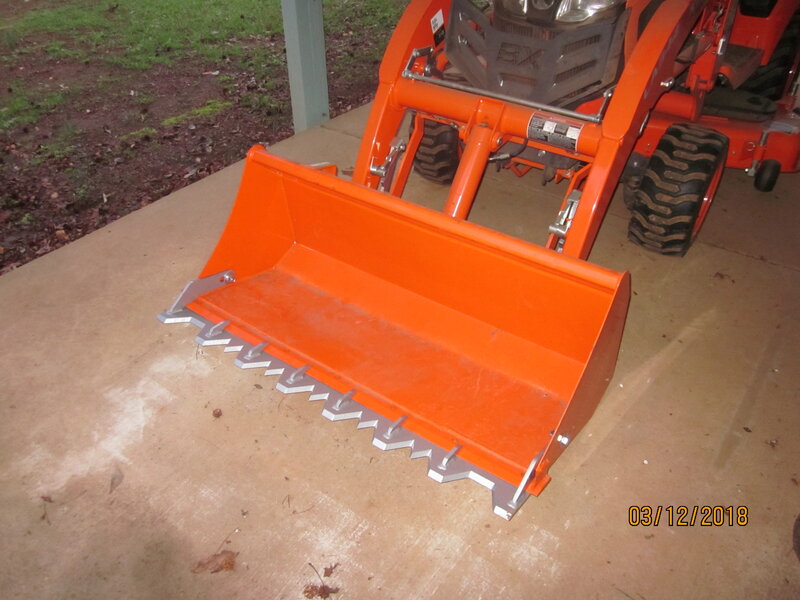 I have a box blade and a regular blade for driveway maintenance. I also have a 763 BobCat skid steer with 2600 hours on a Kubota diesel and use it to clean the corrals, haul hay bales, drill post holes, and so forth. 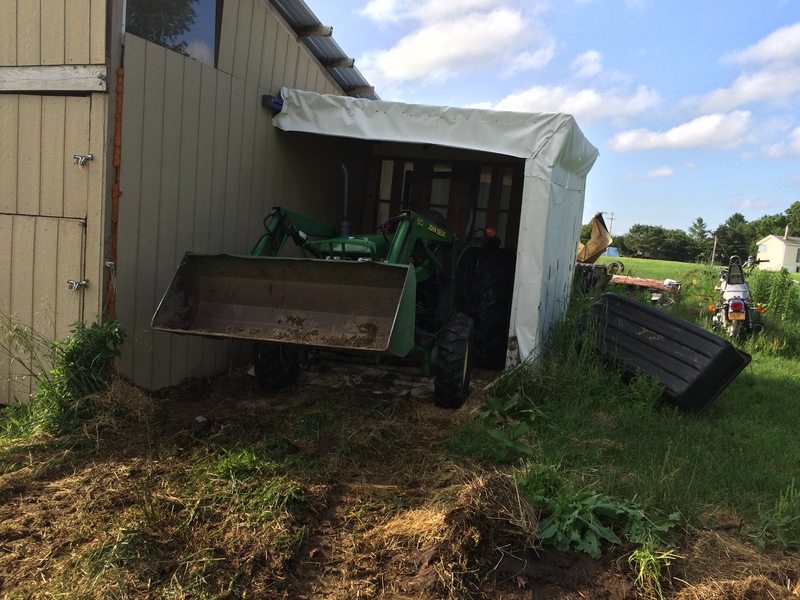 I just kind of want a newer tractor with a diesel and a front loader. 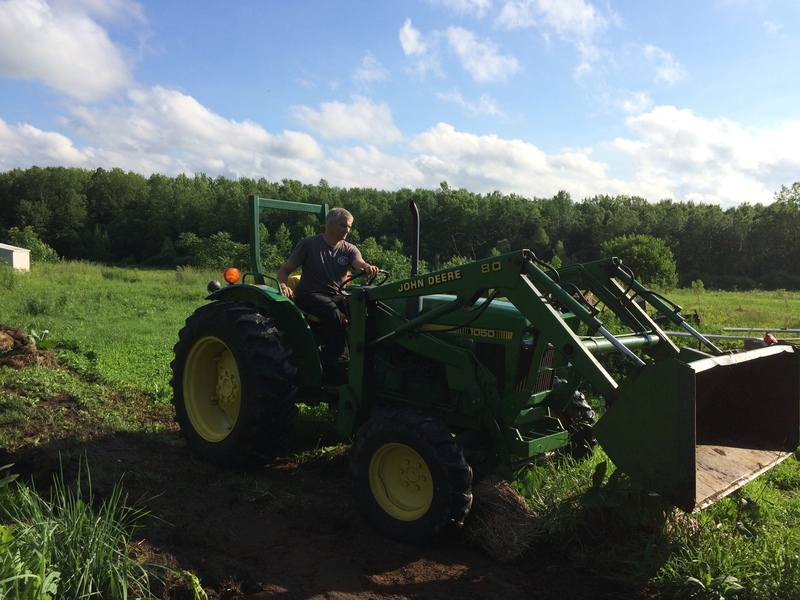 A small tractor cannot haul round bales so the Bobcat has to stay around. I put about 300 hours a year on the Oliver and about 100 hours a year on the BobCat so the usage is pretty light. Here's the one that I rode for many years.....125 hp from the factory, but with the 'smoke screw' turned up to around 140 hp. She's a good horse! RED POWER! Nice horse there Wolfy ! The 1050 is as close as it gets to the 336d but JD never had a model with the same engine , I believe there is also a difference in the hydraulic setup and not sure if JD had the PowerShift semi auto transmission . About the transmission , I have 4 ranges plus the 3 forward , 1 reverse and neutral that you can select without having to clutch . Nearly everything in my area is either green or orange. I think there's only 4 Case/IH dealers and only 2 New Holland/Ford dealers in the state. Three Mahindra dealer in state. Never even heard of LS until Stan mentioned them in his post, but there is a dealer about 40 miles from me. Dancan, the 1050 is high low range 4 forward and one reverse in each. non synchronized standard shift with a clutch ! There were only two of those 7288s around here, that I knew of anyway.....they were commonly known as "The Aardvarks" for their ungainly appearance. I don't think I ever heard of any of them catching on fire......although, it would have been a blessing to mankind if they did! The clay was slicker than snot on a mirror. I was helping level the dirt for a new pad at my nieces house. They are adding two bedrooms. I also bucketed all the stone in and leveled it. I had to go back 5 day's later when it dried up. A set of suitcase weights on that empty front weight rack and a set of tire chains on the rear wheels would improve that situation immensely. True. It did come with chains. I didn't think about putting them on. Their "free" dirt was mostly clay. Their "free" dirt was mostly clay. 'Free' dirt usually is............but you always get your money's worth! You can start loading from the top of the pile of "free" dirt as well. I do like chains too. Oh, I should clarify a little bit. I was digging "extra" dirt from the edge of the pad to add to the top edge. The farthest edge from the house was too narrow and would have gave way under the load of the concrete. For some reason I can't use both hydraulic valves at the same time. I think because it's open center, the first valve takes everything away from the second one. I could have curled then lifted if I had any traction. I was able to scoop up the stone very easily. Although I did mark up the lawn some. I made my own front weight , I used some discarded snowplow cutting edge , cut them to length and welded them together , then I welded on some brackets to set them on my MF1020 . To get your loader control to work better you'll have to change the 2 valves to a joystick . For better digging in that clay type soil , a toothed bucket is the way to go or a backhoe attachment to break it up then load . If you just have a little to dig up a pallet fork, set as close together as you can lock them in, works very well. Shallow cuts and lift. It is surprisingly effective. Dancan, I found a joystick for $87 and will be ordering it. That will also free up two remotes. wsdstan, I wish I had the quick attach bucket. I don't, the bucket is held by 4 large pins. It is 9 degrees F right now and it started up like it was summer. I had it plugged in of course, and heated the glow plug. Still no chugging or anything. Love this thing. I?m really glad to hear how well it?s been working for you! dancan mentioned a toothed bucket----look into a Piranha toothbar, xj. They bolt on the edge of the bucket. Wow, thank you. I haven't seen that design before. I like that it has it's own full cutting edge that supports the bucket edge. That's a good price too. Thanks again!!!! imnukensc, A good friend of mine received a plasma cutter from his mother in California after his father in law passed. The guy built hot rods and it's a big expensive one. I have the 220v and large compressor so he's going to let me use it. You know I can make one of those cutting edges much cheaper. Kline steel has a deal where the more you buy the cheaper it is. I plan on buying almost $500 worth. It should be near $0.50/lb!!! Just put mine on 3 days ago, but haven't had a chance to use it yet. Been cold rain here the past couple days which is going to turn into y'all's next nor'easter. Gotta few little things in mind for it, but nothing as big as digging a pond. Nice attachment Nuke. Looks like it ought to be more more efficient than just a straight blade. Mean looking. That a 50" bucket? Mine is 60" inside width. It would be $300 and that is very reasonable. If I didn't have the time, money, and skill to build one I'd pay that in a heartbeat. I really appreciate that link. It's a great design. I wonder why they left the two little points off the two outside corners? Bucket's only 46.5" so not gonna be digging/building anything major with it, but it'll do what I would use it for. I've told friends that it's the best damned 4 wheel drive wheelbarrow I've ever had. Don't know why they left those 2 points off. Those usually have great hydraulic systems. Faster than mine. Unbelievable the amount of work they can do. They made a belly mower for my 1050 but good luck finding one. I'm going to get a finishing mower eventually.